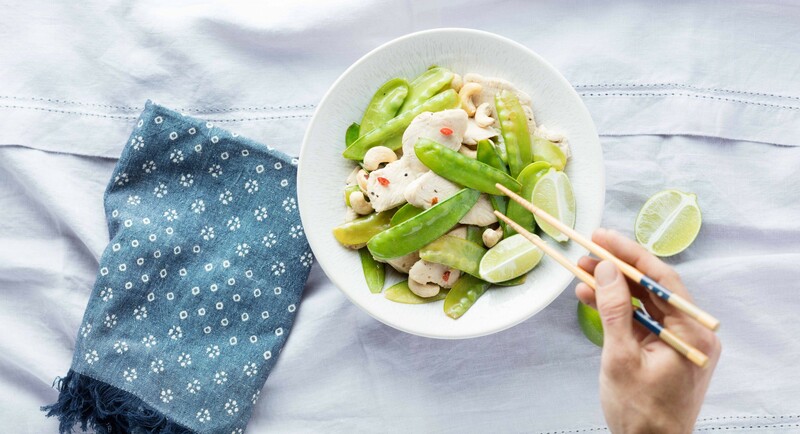 Lime and chile add freshness to a light stir-fry that comes together in just 10 minutes—perfect for a busy weeknight. Heat oil in a large skillet over medium-high heat. Salt sliced chicken breast and throw into skillet along with minced garlic. Coat with the hot oil and cook 3 minutes, stirring constantly. Add chile pepper and snow peas and sauté until chicken is cooked through, about 4 more minutes. Turn off heat and stir in lime juice and cashew nuts. Check for seasoning and serve immediately.